Background Recently, the use of specific exercise programmes to prevent musculoskeletal injuries in team ball sports has gained considerable attention, and the results of large-scale, randomised controlled trials have supported their efficacy. To enhance the translation of these interventions into widespread use, research trials must be reported in a way that allows the players, staff and policymakers associated with sports teams to implement these interventions effectively. In particular, information is needed on core implementation components, which represent the essential and indispensable aspects of successful implementation. Objectives To assess the extent to which team ball sport injury prevention trial reports have reported the core implementation components of the intervention, the intervention target and the use of any delivery agents (ie, staff or other personnel delivering the intervention). To summarise which specific types of intervention, intervention target and delivery agents are reported. To develop consensus between reviewers on the reporting of these components. Methods Six electronic databases were systematically searched for English-language, peer-reviewed papers on injury prevention exercise programme (IPEP) trials in team ball sports. The reporting of all eligible trials was assessed by two independent reviewers. The reporting of the three core implementation components were coded as ‘yes’, ‘no’ or ‘unclear’. For cases coded as ‘yes’, the specific types of interventions, intervention targets and delivery agents were extracted and summarised. Results The search strategy identified 52 eligible trials. The intervention and the intervention target were reported in all 52 trials. The reporting of 25 trials (48%) specified the use of delivery agents, the reporting of three trials (6%) specified not using delivery agents, and in the reporting of the remaining 24 trials (46%) the use of delivery agents was unclear. The reported intervention type was an IPEP alone in 43 trials (83%), education/instruction in how to deliver an IPEP in three trials (6%) and multiple types of interventions (including an IPEP) in six trials (12%). Players were the most commonly reported intervention target (88%, n=46), followed by multiple targets (8%, n=4) and coaches (4%, n=2). Of the 25 trials for which delivery agents were reported, 13 (52%) reported a single type of delivery agent and 12 (48%) multiple types. The types of delivery agents reported included coaches, physiotherapists, athletic trainers and team captains. Conclusions The current reporting of core implementation components in team ball sport IPEP trials is inadequate. In many trial reports, it is unclear whether researchers delivered the IPEP directly to players themselves or engaged delivery agents (eg, coaches, physiotherapists, athletic trainers) to deliver the programme. When researchers do interact with delivery agents, the education/instruction of delivery agents should be acknowledged as an intervention component and the delivery agents as an intervention target. Detailed reporting of implementation components in team ball sport IPEP trials will facilitate the successful replication of these interventions by intended users in practice and by researchers in other studies. Without high-quality implementation, no evidence-based intervention will fully achieve its intended effects in real life.17–27 In addition to information on what can be done to prevent injuries (eg, details of an efficacious IPEP's design), the players, staff and policymakers of sports teams need high-quality information on how it can be done in practice (eg, the staff, training and resources required to implement an IPEP with success). While there is a paucity of knowledge on which factors influence the successful implementation of sports injury interventions,19 ,28 in other research fields the most essential and indispensable aspects of programme implementation have been described.23–25 These aspects have been termed ‘core implementation components’ (also known as ‘implementation drivers’ or ‘core elements’) and include the selection, training and evaluation of the staff who deliver an intervention.22–24 ,29 Identifying and attending to core implementation components is seen as a key process in successfully translating interventions from research into practice.22 ,23 ,28 In the context of team ball sport, injury prevention core implementation components relate to the sports team staff (eg, coaches, physiotherapists, athletic trainers) who deliver the programme to players. Who is the intervention target? Who delivered the intervention and were they under researcher control? to develop consensus between reviewers on the reporting of these components, as a precursor to applying the full RE-AIM framework to the reviewing of team ball sport IPEP trials. The term delivery agents (also known as intervention agents) originates from the RE-AIM framework31 ,32 and refers to the staff who deliver an intervention to the intended beneficiaries. As shown in figure 1, one approach to delivering an IPEP is for researchers to directly deliver the IPEP to players themselves; in other words, it is the researchers who have direct engagement with the players (figure 1A). A more common approach, however, is for the researchers to directly engage with others (the delivery agents) who they would then like to deliver the IPEP to players (figure 1B). For example, researchers might educate coaches or other team staff about how to deliver an IPEP and then require the coaches to deliver this to their players. Illustration of two different methods of delivering an injury prevention exercise programme (IPEP). (A) The research team delivers an IPEP directly to players. The research intervention is the IPEP, and the intervention target is the players. (B) The research team educates and instructs delivery agents (eg, coaches) in how to deliver an IPEP to players. The research intervention is the education/instruction, and the target of the research intervention is the coaches. The injury prevention intervention is the IPEP, and the target of the injury prevention intervention is the players. The following electronic databases were systematically searched from their inception to 20 December 2012 by one of the authors (JO'B): PubMed, Medline, CINAHL, Embase, Scopus and the Cochrane Controlled Trials Register. Search terms were combined into the following search strings, representing key themes: (“Team sport” OR “Team sports” OR Soccer OR Football OR Rugby OR Gridiron OR Basketball OR Netball OR Hockey OR Handball OR Volleyball”) AND (Program* OR Exercise* OR Training) AND (Injur*) AND (Prevent*). Additional articles were sought by scanning the reference lists of retrieved articles and by contacting experts. All identified records were pooled and duplicates removed. The titles and abstracts of all records were screened for eligibility by one of the authors (JO'B). Papers were included if they were English-language, peer-reviewed, reported an IPEP in team ball sport players and included an outcome related to changes in injury incidence. In the context of this review, an IPEP was defined as a structured exercise programme specifically aimed at preventing musculoskeletal injuries. Review papers, abstracts and case studies were excluded. A full list of eligibility criteria is shown in the online supplementary appendix 1. Full-text versions of all remaining trial reports were obtained, and eligibility screening was repeated. The intervention was defined as the change in conditions trialled by the researchers. The intervention target was defined as the trial participants on whom the intervention was imposed. 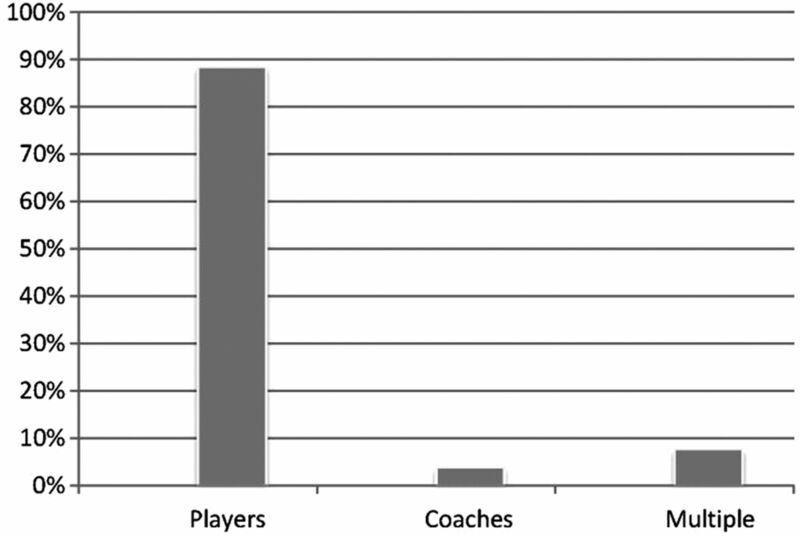 Delivery agents were defined as non-researchers who directly delivered the IPEP to players (eg, coaches). Two methods were used to calculate agreement between the two reviewers. The first method aimed to assess agreement on whether or not the intervention, the intervention target and delivery agents were reported, and only considered the coding of questions as ‘yes’, ‘no’ or ‘unclear’. For this method, the percentage agreement for each of the three questions was calculated as (the number of trials with matching codes/the total number of trials)×100. The second method aimed to assess the level of agreement on extraction of information about the reported type of intervention, intervention target and delivery agents, and considered both the coding and answers to the data extraction questions. For this method, the percentage agreement for each question was calculated as (the number of trials with matching codes and answers/the total number of trials)×100. Percentage agreement was considered the most appropriate measure of reliability as only two reviewers were involved, and the high prevalence of ‘yes’ codes was considered problematic for κ coefficients. The two reviewers met to compare their results and reach agreement on the coding and answers of all eligible trials, through a process of discussion and mutual consensus. Trials were only coded as ‘yes’ or ‘no’ if the relevant information was explicitly reported. For example, trials were coded as ‘yes’ for the question relating to delivery agents if the use of multiple, non-researcher agents (eg, team staff) to deliver the programme to players was explicitly reported. Similarly, trials were coded ‘no’ if it was clearly reported that delivery agents were not involved (eg, trials in which researchers delivered an IPEP directly to players). All other trials were coded as ‘unclear’. After consensus, the percentage of trials coded as ‘yes’, ‘no’ and ‘unclear’ for each question was calculated. From the consensus answers, the percentage of trials reporting each different type of intervention, intervention target and delivery agent was calculated. The systematic search identified a total of 60 eligible papers, covering 52 unique intervention trials (figure 2). As multiple papers covering the same trial were considered together, the following results are presented in terms of the 52 trials. Search strategy used to identify team-based injury prevention exercise programme (IPEP) trials. iSeven additional records were identified in the reference lists of retrieved articles. iiThe most common reasons for excluding records were (1) they were not intervention trials; (2) they did not investigate musculoskeletal injuries and (3) they did not include an injury outcome. iiiFour studies were excluded due to the subjects having existing injuries or not being team ball sports players. The independent-review level of agreement when only considering the codes ‘yes’/‘no’/‘unclear’ was 100% for reporting of the intervention, 98% for reporting of the intervention target and 58% for the reporting of delivery agents. The level of agreement when also considering the reviewers’ extraction of information in relation to “What is the intervention?”, “Who is the target?” and “Who are the delivery agents?” was 79% for the intervention, 77% for the intervention target and 58% for delivery agents. The consensus codes and extracted information agreed upon by the two reviewers are summarised below, and readers are referred to the online supplementary appendices 2 and 3 for a full listing of consensus codes and the reported interventions, intervention targets and delivery agents. The reporting of the intervention and intervention target were coded as ‘yes’ for all 52 trials. For the reporting of delivery agents, 25 (48%) trials were coded as ‘yes’, 3 (6%) as ‘no’ and 24 (46%) as ‘unclear’. Percentage of team ball sport injury prevention exercise programme trials (n=52) reporting each type of intervention. The types of intervention target and the proportion of trials for which each type was reported are shown in figure 4. Players were the reported target of the interventions in 46 (88%) of the included trials. In the reporting of two (4%) trials, coaches were the intervention target, while in four (8%) trials multiple targets, including coaches, team staff, parents and players, were reported. Percentage of team ball sport injury prevention exercise programme trials (n=52) reporting each type of intervention target. Of the 25 trials with clear reporting of delivery agents, the types of delivery agents and proportion of trials for which each type was reported are shown in figure 5. 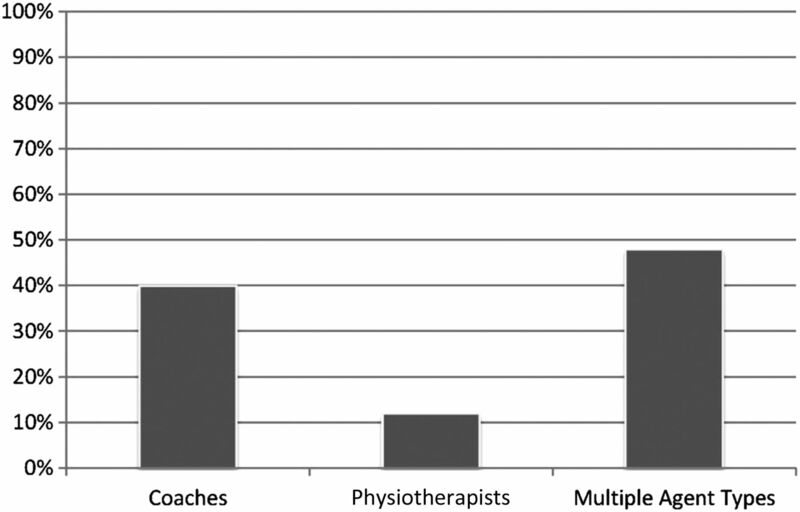 A combination of delivery agent types (including coaches, physiotherapists, team captains and athletic trainers) was reported for 12 (48%) of the included trials. In the reporting of 10 (40%) trials, the delivery agents were all coaches, and in three (12%) trials, they were all physiotherapists. Percentage of team ball sport trials (n=25) reporting each type of delivery agent. Despite the presence of delivery agents being reported in 25 trials, only four (16%) of these identified the delivery agents as an intervention target, and the education and instruction of these delivery agents as an intervention. This is the first systematic review to evaluate the extent to which interventions, intervention targets and delivery agents are reported in team ball sport IPEP trials. Accurate identification of these three components is a prerequisite to more extensive evaluation of implementation components.30 In many of the trial reports included in this review, it was unclear whether researchers delivered the IPEP directly to players or engaged delivery agents (eg, coaches, physiotherapists, athletic trainers) to deliver the programme. Clear reporting of precisely how IPEPs were delivered in their intervention trials is necessary to facilitate the replication of these programmes by intended users in practice and by researchers in other studies. The need to bridge the gap between research and practice and focus more research efforts on the successful implementation and dissemination of evidence-based interventions has been emphasised in many areas of health promotion.17–29 40–42 A key process in enhancing implementation is identifying core implementation components as the indispensable aspects of an implementation programme.23 The authors of intervention trials can potentially contribute valuable information regarding core implementation components, but often these aspects are not sufficiently reported.17 ,30 ,42–45 This review demonstrates the current poor level of reporting implementation components in team ball sport IPEP trials. Many team ball sport injury prevention trials use team coaches, physiotherapists or other delivery agents to deliver IPEPs to players. Most IPEPs are intended to be integrated in the team training warm-up, and the successful adoption, implementation and maintenance of the IPEP will largely be determined by the coaches or other team staff members who deliver the warm-up. While the players are the intended health beneficiaries of IPEPs, a prerequisite to players fully benefiting from the programme is the successful engagement of delivery agents. Educating delivery agents about the IPEP, instructing them in how to deliver it, providing support and evaluating their delivery are all key components for achieving the desired outcome. The key challenge in reaching consensus between the reviewers was ascertaining (from the available reporting) who actually delivered the IPEP to the players: the members of the research team or non-researcher delivery agents such as team coaches or physiotherapists. In many trial reports, details of the IPEP design (eg, individual exercises and dose) were reported in detail, but information on how the IPEP was delivered, and by whom, was either scarce or completely absent. In some cases, it was reported that physiotherapists or athletic trainers delivered the IPEP, but it was not clearly reported whether these individuals were sporting team or research team members. In other cases, while it was reported that coaches were educated about the IPEP, whether the coaches actually delivered the programme was not stated. The lack of clear reporting made it difficult to judge which delivery method (as depicted in figure 1) had been employed by the researchers, and accordingly whether the research intervention should be labelled as an IPEP, education/instruction in a IPEP, or both, and the intervention target as players, delivery agents, or both. The current reporting of core implementation components in team ball sport IPEP trials is inadequate. In many trial reports, it is unclear whether researchers delivered the IPEP directly to players or engaged delivery agents (eg, coaches, physiotherapists, athletic trainers) to deliver the programme. When researchers do interact with delivery agents, the education/instruction of delivery agents should be acknowledged as an intervention and the delivery agents as an intervention target. Detailed reporting of implementation components in team ball sport IPEP trials will allow intended users to successfully replicate these programmes in practice. Recent research supports the efficacy of injury prevention exercise programmes (IPEPs) in team ball sports. To enhance the reproducibility of IPEPs in practice, information is needed on how they were implemented in their evaluation trials. Core implementation components represent the most crucial and indispensable aspects of an implementation programme. The current level of reporting of delivery agents in team ball sport injury prevention exercise programme trials is inadequate. For almost half (46%) of the 52 included trials, it was unclear whether or not delivery agents were used. In many cases, the key interaction between researchers and delivery agents was not reflected in the reporting of the intervention and intervention target. This work was led by JO'B as part of his PhD studies, supervised by CFF. The Australian Centre for Research into Injury in Sport and its Prevention (ACRISP) is one of the International Research Centres for Prevention of Injury and Protection of Athlete Health supported by the International Olympic Committee (IOC). EuroSafe. Injuries in the European Union: summary of injury statistics for the years 2008–2010. http://ec.europa.eu/health/data_collection/docs/idb_report_2013_en.pdf (accessed 10 Dec 2013). Safekids. Game changers: stats, stories and what communities are doing to protect young athletes. http://www.safekids.org/research-report/game-changers-stats-stories-and-what-communities-are-doing-protect-young-athletes (accessed 5 Dec 2013).
. Countrywide campaign to prevent soccer injuries in Swiss amateur players. Am J Sports Med 2011;39:57–63.
. High adherence to a neuromuscular injury prevention programme (FIFA 11+) improves functional balance and reduces injury risk in Canadian youth female football players: a cluster randomised trial. Br J Sports Med 2013;47:794–802.
. ACL injury incidence in female handball 10 years after the Norwegian ACL prevention study: important lessons learned. Br J Sports Med 2013;47:476–79.
. The Preventing Australian Football Injuries with Exercise (PAFIX) Study: a group randomised controlled trial. Inj Prev 2009;15:e1.
. The effectiveness of neuromuscular warm-up strategies, that require no additional equipment, for preventing lower limb injuries during sports participation: a systematic review. BMC Med 2012;10:1–12.
. Research alone is not sufficient to prevent sports injury. Br J Sports Med 2014;48:682–4.
. Implementing and evaluating interventions. In: Baker S, Li G. eds. Injury research: theories, methods, and approaches. New York: Springer, 2012:619–39.
. Implementing studies into real life. In: Verhagen E, van Mechelen W. eds. Sports injury research. Oxford: Oxford University Press, 2010:213–35.
. Implementation and dissemination research: the time has come! Br J Sports Med 2011;45:763–64.
. Dissemination, implementation, and widespread use of injury prevention interventions. In: Doll LS, Bonzo SE, Sleet DA, et al. eds. Handbook of injury and violence prevention. Boston: Springer, 2007:493–510.
. Implementation research: a synthesis of the literature. The National Implementation Research Network (FMHI Publication #231): Tampa, FL: University of South Florida, Louis de la Parte, 2005.
. The Importance of quality implementation for research, practice, and policy. http://aspe.hhs.gov/hsp/13/KeyIssuesforChildrenYouth/ImportanceofQuality/rb_QualityImp.pdf (accessed 11 Dec 2013).
. No longer lost in translation: the art and science of sports injury prevention implementation research. Br J Sports Med 2011;45:1253–57.
. Implementation: the missing link between research and practice. http://nirn.fpg.unc.edu/sites/nirn.fpg.unc.edu/files/resources/NIRN-ImplementationBrief-01-2009.pdf (accessed 12 Jan 2014).
. Applying implementation science to sports injury prevention. Br J Sports Med 2013;47:473–75.
. Bridging the gap between the science and service of HIV prevention: transferring effective research-based HIV prevention interventions to community AIDS service providers. Am J Public Health 2000;90:1082–8.
. The three must-do's of intervention reporting: enhancing sports injury prevention research. Br J Sports Med 2014;48:1267–9. Virginiatech. RE-AIM. http://www.re-aim.org/ (accessed 10 Jul 2013).
. 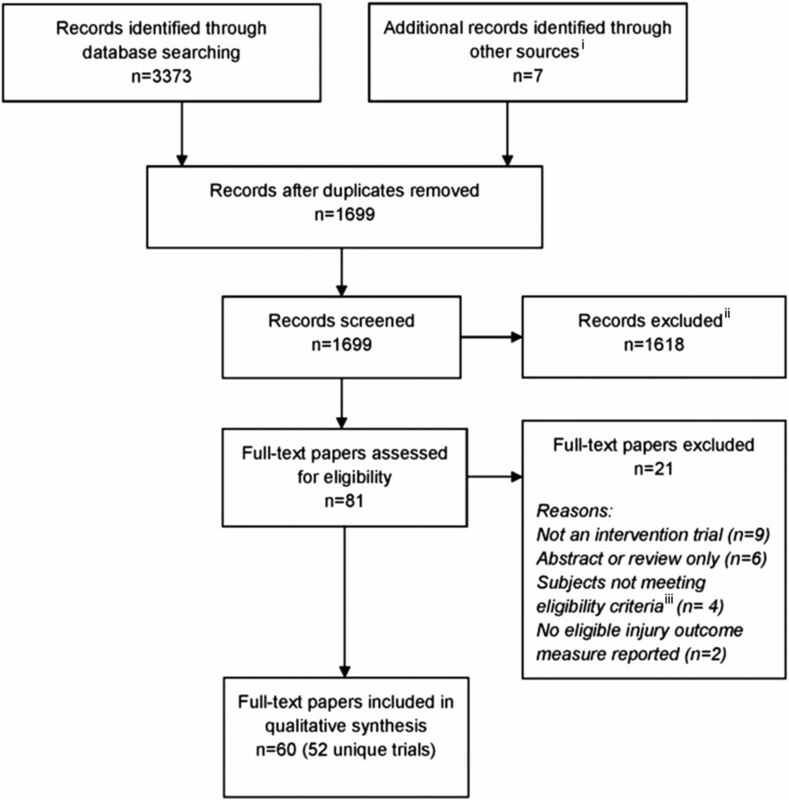 The RE-AIM framework: a systematic review of use over time. Am J Public Health 2013;103:e38–46.
. A twofold reduction in the incidence of acute ankle sprains in volleyball after the introduction of an injury prevention program: a prospective cohort study. Scand J Med Sci Sports 1997;7:172–77.
. Comparison of 3 preventive methods to reduce the recurrence of ankle inversion sprains in male soccer players. Am J Sports Med 2007;35:922–26.
. Translating evidence into policy: lessons learned from the case of lowering the legal blood alcohol limit for drivers. Ann Epidemiol 2010;20:412–20.
. Closing the gap: a research agenda to accelerate the adoption and effective use of proven older adult fall prevention strategies. J Safety Res 2011;42:427–30.
. Implementation strategies: recommendations for specifying and reporting. Implement Sci 2013;8:139.
. Poor description of non-pharmacological interventions: analysis of consecutive sample of randomised trials. BMJ 2013;347:f3755.
. Quality of descriptions of treatments: a review of published randomised controlled trials. BMJ Open 2012;2. pii: e001978.
. What is missing from descriptions of treatment in trials and reviews? BMJ 2008;336:1472–74.
. Understanding the internal and external validity of health literacy interventions: a systematic literature review using the RE-AIM framework. J Health Commun 2011;16(Suppl 3):55–72.
. Translational research: bridging the gap between long-term weight loss maintenance research and practice. J Am Diet Assoc 2010;110:1511–22, 22.e1–3.
. Translating physical activity interventions for breast cancer survivors into practice: an evaluation of randomized controlled trials. Ann Behav Med 2009;37:10–19.
. Statistics used in effectiveness studies. In: Verhagen E, van Mechelen W. eds. Sports injury research. Oxford: Oxford University Press, 2009:183–96. Contributors JO'B designed the study, led its conduct, performed the systematic search and had a major role in writing the paper. CFF independently reviewed the eligible full-text papers, participated in the consensus discussions and contributed to the writing of the paper. Funding JO'B was supported by a University of Ballarat Postgraduate Scholarship. CFF was supported by NHMRC Principal Research Fellowships (ID: 565900 and 1058737).